Sailing for Peace, New Partnerships, Great Successes, Magical Plants and Much More! Thank You for Your Support at the 8th GFDD Golf Tournament!! We are truthfully thankful for our friends and sponsors whose contributions this year have far exceeded our expectations. Your generous donations will benefit the multiple programs and initiatives put into action by GFDD in the Dominican Republic and abroad. As every year, the presence of distinguished guests during the evening gala, including former baseball player Juan Marichal – who, as a tradition, took the first swing – or the president of GFDD / Funglode, Dr. Leonel Fernández, made this tournament a very special event. InteRDom Welcomed Fall 2016 Program Students in Santo Domingo! The 2016 InteRDom Fall Program, which will last until December 16, officially began on September 6, 2016, in Santo Domingo, Dominican Republic, and welcomed a diverse group of students, all from American universities and from varying cultural backgrounds. The students attend Naropa University, Colorado; The New School, New York; and the University of Missouri–Kansas City. Students have the opportunity to experience Dominican culture and customs by taking courses at Universidad Iberoamericana (UNIBE), taking cultural tours around the country, and working closely with Dominican organizations and institutions. A total of 140 screenings in over 40 venues in 11 cities made 2016 the largest and most influential Festival to date. A green carpet rolled out to inaugurate the 6th edition of DREFF at Agora Mall with a screening of the documentary The True Cost and a magnificent celebration of sustainable fashion. Dr. Rajendra Pachauri, recipient of the 2007 Nobel Peace Prize, along with the movie Landfill Harmonic, winner of the Green Film Network Award (the so-called Oscar of environmental film), were the stars of the closing evening, which took place at Funglode’s headquarters in Santo Domingo. Kelmer Messina, a Dominican law student, participated from September 2–16 in the Summer Institute in Transnational Law and Practice developed by the University of Washington (UW) School Law in Seattle – one of the world’s leading centers for innovative teaching and research on international, comparative, and US law, according to the academic institution. The Global Dominican Academic Exchange (GDAE) program provides law students as well as legal professionals and researchers from all over the world a strong foundation in the structure, culture, and thinking of the US legal system and practice. A law graduate and current PhD candidate at the University of Barcelona, supervised by Dr. Estevez Pardo, Sergio is interested in spatial planning. His dissertation focuses on the connection and potential synergies between climate change, sustainable development, conservation, human well-being, and environmental impact assessments. During his research in the DR, he will collect and investigate local perceptions of the public administration; the specific tools the public administration must use to face different decisions when those decisions are scientifically uncertain; and how those tools can help in the fight against climate change. It will further suggest methods to create and guide society toward sustainable development. GFDD boarded the world’s largest passenger ship currently sailing around the world for peace, for a “Floating Festival for Sustainability”, on October 20. The event was an opportunity to highlight the partnership between UN, diplomatic and civil society actors in promoting and advancing the United Nations Sustainable Development Goals (SDGs). This very special evening included presentations, music, exhibitions, cultural performances, and an eco-fashion show. Global Foundation for Democracy and Development (GFDD) in partnership with the United Nations Association of America Council of Organizations (UNA USA COO) and the Institute for Life Sciences Collaboration will host a panel discussion to celebrate the adoption of the 2030 Agenda for Sustainable Development (the 2030 Agenda), as ratified by the UN General Assembly. 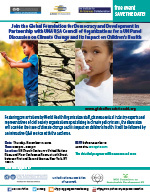 Featuring presentations by UN Agency staff, pharmaceutical industry experts and representatives of civil society organizations specializing in climate policy issues, the discussion will consider the issue of climate change and its impact on children’s health. It will be followed by an interactive Q&A session with the audience. Location: UN Church Center, 2nd Floor Conference 777 United Nations Plaza (at 44th Street, between First and Second Avenues), New York, NY 10017. Dominican Film Showcase in New York City! After Washington, DC, its New York’s turn to host the Dominican Film Showcase. GFDD once again will showcase a sample of the best films produced recently in the Dominican Republic by Dominican filmmakers on Dominican issues. The two-day event will take place at Symphony Space on Broadway. Joaquín, a recently divorced airline pilot, meets Manolo and Juan Luis, who are also divorced. Together, they establish rules to support their life as new bachelors. Everything changes when they try to seduce their housekeeper. Leidy, Fina, and Clara leave their children in distant towns to be raised by relatives while they are away caring for other people’s children. Going back and forth between urban and rural scenarios, this documentary goes deep into the conflicts faced by live-in nannies. In a love chain, where mother figures are substituted and duplicated, bonds grow strong between kids and their nannies, and between the nannies’ children and the grandmothers or aunts who care for them. Is there just one way to define motherly love? 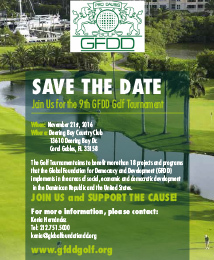 The Golf Tournament aims to benefit more than 18 projects and programs that GFDD implements in the areas of social, economic, and democratic development in the Dominican Republic and the United States. Join us to support the cause in Miami on November 21, 2016. GFDD’s Dominican Film Showcase Embassy Edition will screen the film Sugar, a sports drama, directed by Anna Boden and Ryan Fleck, that follows the story of Miguel Santos, a.k.a. Sugar, a Dominican pitcher from San Pedro de Macorís struggling to make it to the big leagues and pull himself and his family out of poverty. Playing professionally at a baseball academy in the Dominican Republic, Miguel finally gets his break when he advances to the United States' baseball minor league system; but when his play on the mound falters, he begins to question the single-mindedness of his life's ambition. When: Thursday, December 8th, 2016. FREE! A light refreshment will be provided. 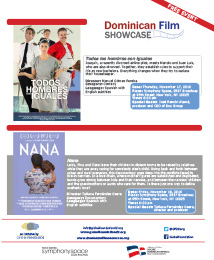 The Dominican Film Showcase Embassy Edition is an initiative of GFDD in collaboration with the Dominican Republic Embassy in the United States.